We originally ran this sweepstakes post back on March 9. 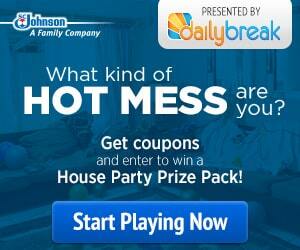 Just want to remind you that you have until April 15, 2015 to enter the SC Johnson Products Hot Mess Sweepstakes. Just head to this link and take a short quiz to enter this free sweepstakes. After you take the quiz you will receive a coupon for $1.50 off SC Johnson products. You will then be automatically entered to win the Grand Prize House Party Pack featuring a 50″ TV, Bose Sound System, $200 Visa gift card, and cleaning supplies! Five runner-up finalists will win a $50 Visa gift card. Remember the SC Johnson sweepstakes ends April 15, 2015!